In this study we compare the volatility of reported profit-and-loss (PnL) for credit portfolios when those are measured (accounted for) following respectively the IFRS 9 and CECL accounting standards. The objective is to assess the impact of a key methodological difference between the two standards, the so-called Staging approach of IFRS 9. There are further explicit differences in the two standards. Importantly, given the standards are not prescriptive, it is very likely that there will be material differences in interpretation and implementation of the principles (for example on the nature and construction of scenarios). In this study we perform a controlled comparison adopting a ‘ceteris-paribus’ mentality: We assume that all other implementation details are similar and we focus on the impact of the Staging approach. A homogeneous initial maturity profile extending to four annual periods. No amortisation or optionality for further draw-downs. The CECL provision methodology is based on the forward LECL estimate as indicated above. It is worth highlighting that the forward CECL change is assumed to driven entirely by dynamic factors – that is, we assume that the static creditworthiness characteristics of the borrower remain the same. For example the borrower does not change within the calculation horizon their leverage by additional borrowing and they do not modify their asset volatility by changing their business model. The borrower is thus effectively re-rated in future periods by monitoring the development of their dynamically evolving asset base versus the fixed leverage. The IFRS 9 methodology requires additional assumptions about the (internal) procedure followed by the reporting entity for assigning initial and ongoing Stage classifications (State 1, 2, or 3) to the portfolio assets. Initially all assets are starting in Stage 1. Assets exhibiting a default within the fist year become Stage 3 assets and are assumed resolved immediately (no further PnL impact). For simplicity we assume 100% LGD. Assets deteriorating in credit worthiness within the first year may migrate from Stage 1 to Stage 2. We use 1, 2 or 3 rating level migrations as the threshold for re-assigning to Stage 2. This emulates policies of different aggressiveness. A typical annual transition matrix is taken as input for the analysis. The portfolio is assumed to be, initially, homogeneous in one of the rating states (we will vary that initial assignment to assess at a high level the sensitivity of IFRS 9 / CECL volatility differences to credit quality. 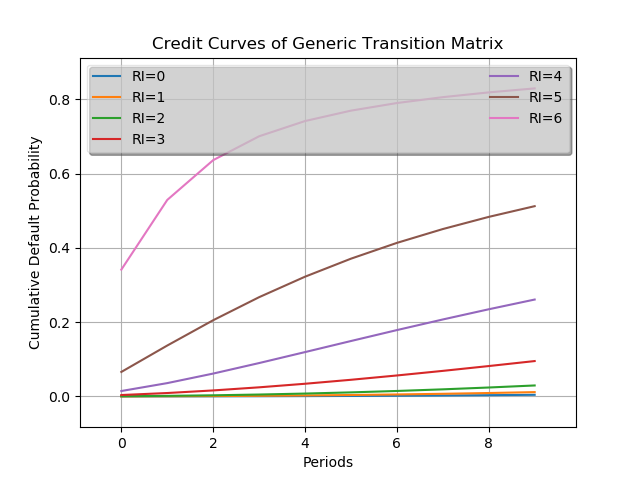 NB: It is well know that the multi-period default curves of credit assets originated at very low credit quality deviate from those obtained by exponentiating short period matrices but they are included here for comparison purposes. We present here a summary of a parametric study that touches on two key dimensions: The credit quality of the portfolio, which governs the intrinsic credit risk and the calibration of the Staging methodology. As indicated in the previous section, in each calculation within the parameter survey we obtain the distribution of losses and forward loss expectations. This yields a very rich set of data – in this blog post we will only highlight some of the features. Initially all portfolios start on the lower right corner of the diagram (100% Stage 1, 0% Stage 2 and 0% Stage 3). Each point represents the allocation of exposure to Stages at the 1Y time horizon. 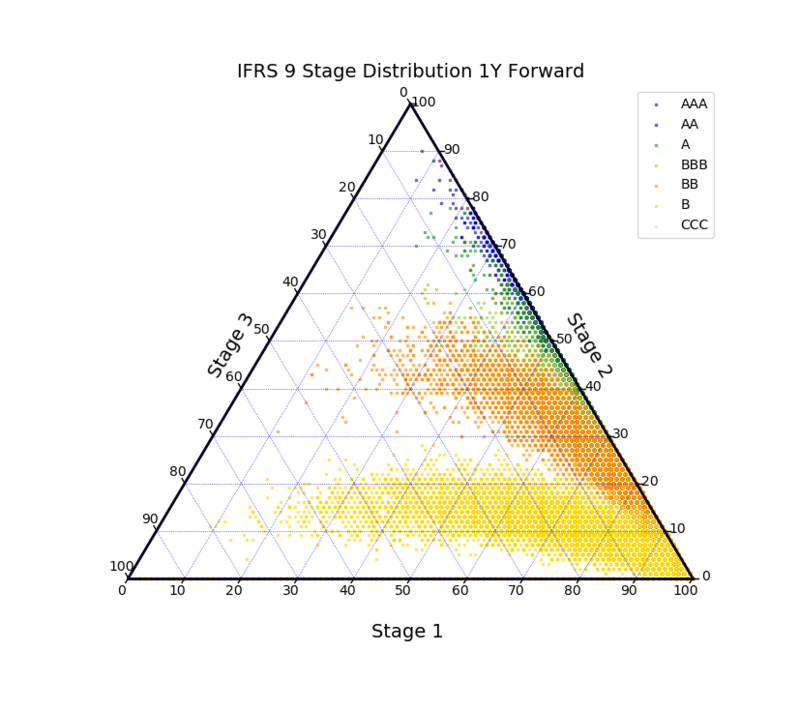 As expected we see that in tail scenarios high quality grades primarily migrate to Stage 2 (top corner of the diagram) with relatively fewer realized defaults (Stage 3). 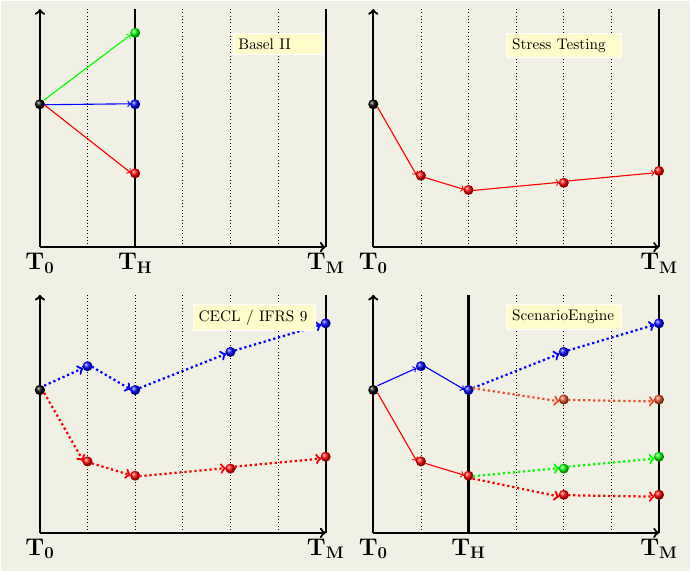 Lower credit qualities cumulate in adverse scenarios towards the Stage 3 corner (left side), with the most extreme example being the CCC category for which the distinction between Stage 1 and Stage 2 may not be particularly informative. Next, we take a look at the influence of the IFRS 9 Staging methodology on the volatility of reported provisions. In our simplified framework we explore this by varying the number of rating classes (downward) migration that must occur before an exposure initially assigned to Stage 1 is transfered to Stage 2. We use one, two or three rating downgrades. It should be already evident from these first analyses that the introduction of IFRS 9 and CECL opens up entire new dimensions of credit portfolio management. We aim to slowly unpeel these in a series of blog posts.